Viewing art is like falling in love. Art has the ability to transport and move the viewer. Art expresses emotion and beauty like nothing else. Art is truly an affair of the heart. Priscilla gives David a big hug in celebration of his last cardiac rehabilitation session at Dixie Regional Medical Center. Recently, nationally acclaimed artist and watercolorist, David Drummond, experienced a heart-stopping moment that brought him to St. George. Through an affair of the heart, Drummond and his wife, Priscilla, have come to love and support Dixie Regional Medical Center. While earning a PhD in physics, Drummond painted and sold watercolor paintings to make ends meet. He went into his family’s business with his brother who develops scientific medical equipment, items that are used every day in cardiac catheterization labs. Currently, Drummond paints full time. He has artwork in many museums and was commissioned by the White House to paint their annual Christmas card. The Drummonds live in Albuquerque, New Mexico, where Drummond paints what is close to his heart. He loves the red bluffs of the southwest and especially Lake Powell. He loves to paint the ebb and flow of blue water against magnificent red cliffs. Subsequently, the Drummonds have a second home in Greenhaven, Arizona, near Page, where they live part time. They were in Greenhaven when David’s heart stopped early one morning as they were lying in bed. “It all happened so fast,” said Priscilla. “One minute David was saying his chest felt funny, and the next I was trying to get him to stay awake, performing CPR, and calling 911.” The emergency responders immediately called for a helicopter which landed in their front yard. Drummond was rushed out so quickly, he did not have ID. The medical technicians on the helicopter kept asking him his name, but all he remembers is that it was difficult to breathe, let alone answer. Drummond arrived at Dixie Regional Medical Center as a John Doe. Priscilla meanwhile made a few key phone calls to friends and family and was driven by a neighbor to St. George. Cell service is inconsistent on that drive, so it was David’s brother in Philadelphia that was able to call Dixie Regional and supply a name and medical history for Drummond who flat-lined again as the helicopter landed. Drummond spent a week in the hospital. 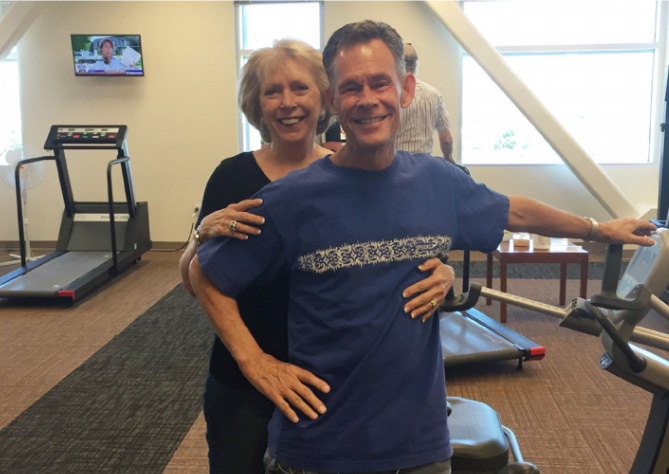 He and Priscilla were so impressed with the care he received, that Drummond decided to stay and attend cardiac rehabilitation at Dixie Regional. An ultrasound recently revealed no major damage to Drummond’s heart tissue. A true miracle.